All working French Connection discount codes, vouchers and offers for April 2019 are shown below. Student Discount Online All students with a valid NUS/NUS Extra or Irish Student Travelcard are entitled to a 15% discount on all full price* French Connection products purchased online at www.frenchconnection.com. To verify your student ID you must sign in using our third party verification platform MyUnidays. *(Excluding giftcards and products from the Home category). Student Discount In-store All students with a valid Student Card are entitled to a 15% discount on all full price* French Connection products purchased in French Connection stores in the UK. *(Excluding giftcards and products from the Home category). To redeem the Discount online, sign in or register to MyUnidays and follow the steps to get your unique promotion code https://frenchconnection.myunidays.com/. 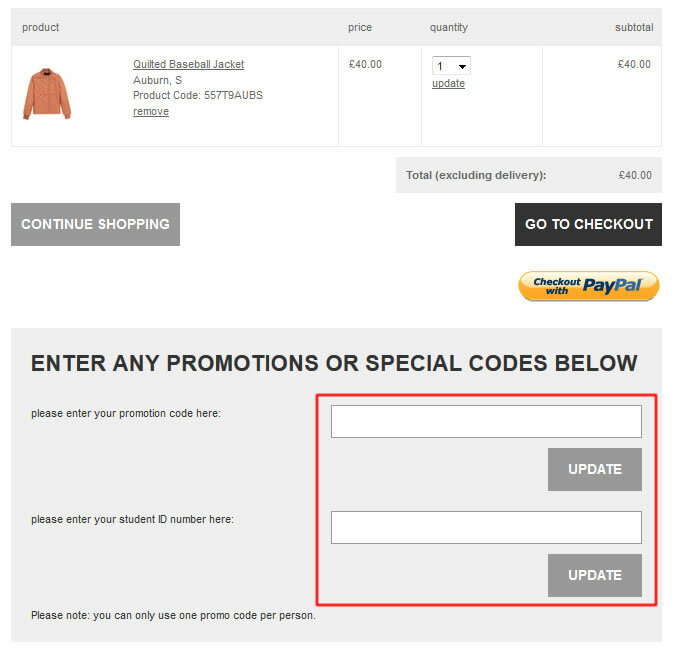 Enter your unique code in the space provided at the online checkout. To redeem the Discount in-store, show your valid student card at the checkout in-store. The Discount may not be exchanged for cash and is non-transferable. Returned items will be refunded at the discounted price paid. This does not affect your statutory rights. The Discount may not be used to purchase giftcards or to settle store card accounts. Discount cannot be used in conjunction with any other promotion or offer. French Connection reserves the right to refuse any student ID that it deems to be invalid or fraudulent. French Connection reserves the right to (i) cancel this offer at any time; (ii) refuse to allow any individual to participate in this offer; and (iii) amend these Terms & Conditions. Founded by Stephen Marks in 1972, French Connection continues to occupy a well deserved space in the high street to this day, offering design-led fashion at affordable prices. Innovation is always at the heart of the brand's image; French Connection prides itself on delivering distinctive clothing for men and women, founded on a passion for utilising new and unique ideas to create individual products which are all at once synonymous with the brand. Over the last 40 years, French Connection has developed a true sense of identity, establishing a strong core clothing brand, which embraces both a love of current trends and timeless style, and has also branched out to create accessory lines and toiletries. Its portfolio now boasts an impressive plethora of products, from sunglasses and opticals, to watches and shoes, to women's and men's toiletries. The brand's philosophy lies in embracing change and novelty, but all the while continuing to stay rooted in the basic premise of striving to offer quality and affordability. For this reason, the brand has grown to become one of the most well revered and recognised names on the high street, with stores across Europe frequented by customers who are faithful to the brand's delivery of quality goods. Although they always deliver on quality and longevity, French Connection's products can sometimes be a little too pricey for students. However, they do offer a 15% discount with NUS cards or UNIDAYS, which can knock an expensive pair of shoes down to a much more affordable amount. Other typical offers can include occasional voucher codes for free delivery when you spend over a certain amount, making an otherwise slightly too expensive order far more accessible. Sometimes, codes are available for free next day delivery, meaning that you can have almost instant gratification buying online, and don't have to wait the typical 3-5 working days before you can try on your purchases – perfect for when you need to make a statement in a new outfit needed for a last minute event. As well as free delivery, free returns codes often run for a limited time, meaning that you can effectively try before you buy at no extra cost - avoiding the usual drawback of not being able to see an item of clothing on yourself before committing to a purchase. Codes offering 20 or even 30% off also run regularly – sometimes as much as once every month, especially during sale season in summer and the new year – so keep checking back on these pages before committing to any purchases, as you could save yourself a lot of money. With 20% off a new suit, you can easily save yourself around £40, leaving you some extra cash to put towards some new brogues or sunglasses to complete the look.